Making the gigantic desktop power in a tiny package, the Mini PC full of all traditional desktop's features. Powered by the Intel processors, get avoid of cluttering and compromising performance. Do business at home, watch stunning 4K video or have a big fun when playing games. Compact, Light, Quiet and Powerful. When the operation system crashes, please do not unplug the power adapter directly, just press the reset jack, the device will restart automatically. It doesn't support touchscreen monitor. For more information or technical support, you could also enjoy our forum: www.minisforum.com, thanks. 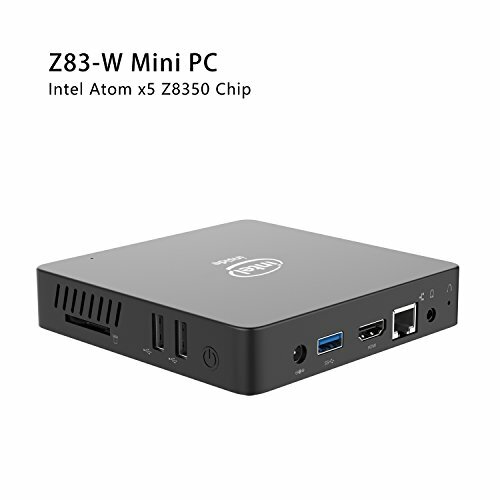 Excellent Processor and OS: This small mini pc equipped with advanced processor Intel Atom X5-Z8350 and Windows 10 Pro pre-installed, which offers an excellent performance of Internet and Office applications, Media player, Monitor, Projector and TV. An ideal mini pc for users to play games, utilize apps, stream video contents etc. Fanless and Silence design: Very Silent with great performance, this mini pc adopts energy efficient components and cooling elements, there is no noisy during operating and the resolution up to 3840*2160@30Hz and plays 4K video smoothly. Large Capacity: 2GB RAM+32GB ROM+128GB SD extended capacity(the SD card didn't include), Gigabit Ethernet LAN 1000M, Dual Band WiFi, Dual Screen support to ensure smooth navigation, responsive work processes and comfortable handling of apps and files. Package: 1x Z83-W Mini PC, 1x Power adapter, 1x HDMI Cable, 1x Manual. This Z83-W Mini PC supports Power On after Power Failure. Certifications and Service: Obtained FCC ,CE ,ROSH, C-TICK certifications. 1 year warranty, 1 month free return, get after sell service support within 24 hours. If you have any questions about this product by MINISFORUM, contact us by completing and submitting the form below. If you are looking for a specif part number, please include it with your message.